The lowdown on a weekend at the 2019 Monaco Grand Prix, including the full on-track schedule for this year’s race on May 23-26. Monaco is the only circuit on the calendar to hold the first two Formula 1 practice sessions on Thursday, rather than Friday, which gives the weekend schedule a very different appearance. Circuit entry is free on Friday and whilst there’s no F1 action, it’s still worth going along for the Formula 2 feature race. Other support categories at Monaco this year are the Formula Renault Eurocup and the Porsche Mobil1 Supercup. When the track is closed, ten entry gates provide access. (See below for recommended entrance gates for each grandstand and check the interactive map here.) Inside the circuit, a series of bridges, walkways & tunnels provide access to the grandstands as well as bars, restaurants and hotels. Ample signage will help you find the way. Access to some bridges and tunnels is restricted to fans holding a ticket for the grandstands in that section. Entry to the track and grandstands is FREE on Friday. There’s no F1 action, but all three support categories are on track in the morning. The highlight is the Formula 2 feature race, which begins at 11:30. Get there early if you are keen to bag yourself a grandstand seat (especially in one of the smaller grandstands), as ‘full is full.’ The track is opened around 14:30. This is a great opportunity to do a proper track walk, or participate in the Pit Lane Walk. The trackside atmosphere at Monaco is fantastic and there is plenty to do in the principality, particularly when the on-track action has finished for the day. The main fanzone (known as MGP Live) with interactive displays, big screen and more is located next to Place D’Armes. It’s definitely worth staying around after dark as Monaco comes alive on Grand Prix weekend with a great party scene, much of it on the streets. The main entertainment hub can be found in the Harbor area, where the best bars and restaurants, not to mention the super yachts, are located. Even if you don’t know the right people to get into the VIP parties, spending a few hours on Friday or Saturday night in Monaco is an experience not to miss. Make sure you don’t leave Monaco before you have had a drink at the famous La Rascasse bar on the corner of the same name near the pits entrance. Click here for a selection of Monaco’s best drinking spots. Please note: no information has been provided in the official schedule for 2019 about the Pit Lane Walk, but we assume it will still take place according to the information provided here from previous years. The Pit Lane Walk takes place on Friday afternoon after the track is opened at 14:30. Entry is from the pit exit on the main straight. It used to be easy enough to join the Pitlane Walk without a weekend ticket, but the organizers have recently tightened the entry requirements, so don’t forget to bring along your Saturday/Sunday tickets. It’s still possible you can get in without a weekend ticket, but we cannot guarantee it. As with everything at Monaco, there is not too much room in the Pit Lane and you can expect serious overcrowding, especially in front of the top teams’ garages and when the drivers are about. If you don’t like overcrowded spaces, we recommend giving this particular activity a miss. Autograph sessions and interviews with the drivers take place on Friday afternoon from 14:00-17:00 in the MGP Live Fanzone on Place d’Armes. Entry is FREE, no race ticket required. The schedule of driver appearances will be available a few days before the race weekend – we will update this page then. It’s no problem to bring your own food and drinks into the circuit if you wish, but don’t bring any glass bottles. The quality and choice of trackside food stalls is not too bad in Monaco. Most grandstands have reasonably-priced catering stalls nearby. You’ll pay around €5-6 for a large beer and a similar amount for a baguette or similar. Don’t forget you are in a city, so supermarkets, cafes, restaurants and bars are located all around the circuit. If the Monaco prices are beyond your budget, there are cheaper places to each further from the action, especially ”over the hill’ in Fontvieille. Both temporary and permanent toilet facilities are also dotted around the circuit, though you’ll need to queue at peak times. If you are staying with most other fans outside the principality, we recommend taking the train to Monaco on Grand Prix weekend. each day. If you do decide to drive yourself, then Thursday and Friday are the best days to do this, when there are less fans and less traffic. (We don’t recommended driving on the weekend.) There’s underground carparks aplenty close to the circuit, but it’s a good idea to pre-book to be sure of a space in your preferred location. We recommend parking at the Stade Louis II football stadium in the Fontvieille area of the principality (click here for map link). A day of parking costs around €20 and you shouldn’t have trouble finding a space, even on race day. Been to the Monaco Grand Prix? Leave a comment with your trackside tips! Use our budget planner to help plan the cost of your trip to the Monaco Formula 1 Grand Prix. Your guide to off-track activities away from the Monaco Grand Prix in Nice and further afield, including ideas for extended holidays on the French Riviera. The Monaco Grand Prix takes place this year on May 23-26, 2019. History, facts and background of the Monaco Formula 1 Grand Prix. Useful travel information to read before you plan your trip to the Monaco Grand Prix. The next race takes place on May 23-26, 2019. Where to stay for the Monaco Grand Prix. Best rated hotels in Monaco, Nice, and further afield. Your comprehensive guide on buying tickets and where to watch the action at the Monaco Grand Prix. I’m attending the Grand Prix next week, is there an f1 village at the circuit or merchandise stands to buy team gear? Hi Darren, thanks for your question. There is not an actual F1 village at Monaco. The closest thing is at Place d’Armes, a square close to La Rascasse where there are various demos, a small stage etc and merchandise for sale. You will also find merchandise stalls on all the main roads close to the circuit (such as Rue Grimaldi, Rue Princesse Caroline). Some of them sell official team gear, others sell ‘Monaco style’ t-shirts etc. It’s no more expensive than at other circuits. Enjoy your weekend! I will be attending to the Monaco GP 2016 together with my friend, any good tip re where we can meet drivers, ex-drivers, pundits etc apart from the Friday Pitlane Walkabout? Hi Antonello, lucky you. Monaco is a small place and if you keep your eyes open as you walk around, you will definitely run into famous F1 people all over the principality on Grand Prix weekend. If you want one particular spot, then you will see everyone if you hang around near the harbor next to the Rascasse corner (opposite side of the street from the bar of the same name). This is the main exit point for the paddock. Good luck! Any idea when will the 2017 Trackside Article go out, please? Hi Antonello, we will update the article this week. Is there any official driver’s autograph signing sessions in Monaco? Hi Jeanne, the only official time when the drivers will be signing autographs is during the fan’s pitlane walk on Friday afternoon. Hi andrew, where’ s the entrance for the pitwalk? Hi Leon, the pitlane walk for fans starts near the pit exit. Hi Karla, if you will be sitting in the Rocher (general admission) section, it would be worth taking along your small camping chairs. Many regulars in fact put their chairs in place several days before the weekend starts to make sure they get a good spot. Good luck! 1. Do you know if with the Sunday ticket (race) I can see all the previous races (Porsche Mobil 1 Supercup, GP2 Series, Renault Series 2.0)? I want to book a train ticket and I don`t know if I`m allowed to enter at ~9:00. 2. Can I bring my own water and food (in a bag) on the circuit ? Hi Alex, yes you can see the support races on Sunday. Porsche Supercup and Renault Series 2.0 have races on Sunday morning (not GP2, unfortunately.) I suggest getting there as early as possible on race day! Yes, you can bring water and food (but make sure in a plastic bottle). It’s also a city, so there are supermarkets in and around the circuit where you can stock up cheaply. Have a great day! I have the ticket for Sunday but not for Saturday. Can I go to Monaco on Saturday after the qualifying ? Hi Michael, the track is opened after the racing at 18:30 on Saturday. After this time, you will be free to enter and walk around. It’s a great opportunity to soak up some of the atmosphere and maybe even meet some drivers or famous people. Have a great time! If you are around on Friday, the track is opened from around 14:00. Hi Emma, the track opens at 18:30 tonight and won’t close again until 07:00 tomorrow morning. You can enter the circuit area tonight till late. Enjoy! We live in south of France and are debating to take the train or drive ourselves tomorrow. What’s your advice? I don’t recommend trying to drive all the way to Monaco on race day. Instead, why don’t you go to one of the neighboring towns (Nice, Menton etc) and get a train from there. The earlier the better to miss the crowds and don’t be in a hurry to return right after the race. Enjoy the day! The trains can be pretty busy, but you should be able to get on. Make sure you buy your return ticket in advance, otherwise you would need to line up at the train station to buy tickets. Don’t do it if your ship leaves before 7pm – you will be worried the whole day about missing it, and won’t enjoy the race! Great travel guide again! After my first vist in 2015 I wanted to return for a longer visit. We just booked tickets for the Monaco Grand Prix 2017 for saturday (tribune N) and sunday (Z1). Hi, just wanted to know what the earliest is to enter on the Thursday practice? Thanks for the prompt reply. Taking my 11 year old and I’m sure we’ll have a blast. That’s great. I look forward to the day I take my daughter (currently only 4 months old) to her first race! Great to read a lot of tips. But I maybe I have a strange question. I cannot find anything on a map where toilets are. I have searched a lot but nothing to find. Can you tell me if there is one in the area nearbij grandstand T? Hi, don’t worry it’s not a strange question! All the grandstands at Monaco have portable toilets nearby – either individual portaloos, or larger portable buildings. Thanks for your answer. It will be the first time at monaco gp. Do you have any tips for taking with us to the circuit? Hi Esther, what to take to the circuit? Make sure you check the weather forecast and pack accordingly for rain/sun. It can get quite warm in the south of France in May, so hat/sunscreen is recommended. Also take along a spare battery for your camera and a phone charger – you will take more photos and use more battery life than you expect! Hi, we have general admission Rocher tickets, are there any food/ bars in that area? Can we roam about onece we’re in or are we restricted to that area? Also is there much opportunity to buy better tickets outside. Hi Jo, as you are probably aware, the Rocher area is on the hill leading up to the castle. There are food/drink stalls nearby, especially at the bottom of the hill. Monaco is a city, so you can walk around quite a bit without restrictions, though you probably won’t be able to see the track from anywhere else. Buying better tickets? There are touts everywhere on GP weekend, but don’t hand over any money before you know exactly what you are getting. Hi! I have bought tickets for this year’s Thursday event. What time should I reach Monaco? I am coming from Cannes via train. And should I go back immediately after the races for the day are over or wait a few more hours for any extra events? Hello Akul. I would try and get to the track as early as possible. The F1 cars hit the track at 10:00, so be there for that! At the end of the day, it’s definitely a good idea to stay around and explore the streets. The track is open from 19:30 and you can walk around and explore. There’s also lots of nightlife and bars, a great atmosphere. Don’t forget that Friday is free as well, if you can make it. Have a great time! Wondering if you can help me, going to the Monaco Grand Prix with my husband and doing a pit walk on qualifying day. Done this 3 years ago and we had a lap around the track. When we went the year after they had stopped it complementary. I am just enquiring if you are still able to do this. (Doesn’t matter if there is a charge). This would be fantastic if you could help as it is my husbands 50th birthday. Hi Fiona, sounds like you had Paddock Club tickets? These are pretty expensive, but you do get daily pit walks. I’ll put you in touch with our ticket supplier in Monaco to discuss. Hi there, i require something quite special and was wondering if you would be able to assist? Good friends of ours are going to the Monaco F1, we are from SA and Friends for almost 20 years now. I would like to arrange something special for them if possible as it is a once in a lifetime experience. We were ourselves blessed to visit the indy 2011 motogp and managed to get a special tour of the Yamaha garage – i will never forget that experience. Is there any way for them to be able to visit a top team’s garage or be involved in a team experience through special access? Your assistance will be greatly appreciated as I would like to make their trip extra special with a surprise – iknow I’m shooting high but Ferrari, McLaren or Red Bull will be super awesome! Baie dankie! We have tickets booked for Grandstand N on the Saturday only, just wondering do you need to arrive at a certain time, or are stands accessible throughout the day? We are happy to arrive early as want to make the most of it but wondering what the best time to get there would be and also if you can leave the stands and come back at any times? Also, we are staying in Nice and considering booking private transportation, it is quite expensive, and wondering is it worthwhile or are we likely to just be stuck in traffic? Hi Sarah, grandstand N is a good choice. I would aim to get there for around 9am, in time for the first Formula Renault race. You can come and go from the stands during the day, no problem. From Nice, your best bet is to take the train – the only tip is to buy your tickets ahead of time if possible (even the day earlier). That will save you lining up to buy tickets, especially when returning from Monaco. And don’t be in a hurry to go back at the end of the day. The track opens at 18:30; you can then do a track walk or just explore, and have a few drinks in the harbor. Enjoy! Hi, Thank you for great information about F1 in Monaco! I’ve got tickets for Grandstand K4 on saturday and I’m also going on friday. Hi Frederick, the pitlane walk begins from around 14:30 on Friday, when the track opens. You enter from the pits exit, so you start with the ‘slower teams,’ where there will be less fans and more chance of an autograph. By the time you get to the end with the ‘fast teams’ it gets pretty crowded and you will have less chance of getting an autograph (and more chance of getting crushed). If you are really keen to get a particular driver’s autograph, then try to be one of the first in line and hang out in front of his team’s garage. Good luck! My wife and I are going and I have been trying to find out if SLR cameras with removable lens are prohibited. Is there someplace I can find the list of prohibited items that cannot be brought into the stands? We have tickets by the “pool” and if we can bring in our camera gear we want to. You mentioned that the entrance for the pit lane walk is the pit exit. What is the best way to get there so as to get to the head of the queue? Hi Neil, I am not 100% sure, but this is directly behind the K grandstand. So I would suggest going near the back of the K grandstand, there should be an entrance on to the track and to line up for the pitlane walk. Good luck! We went to the Monaco GP last year. All day friday was an open track with no activity and cost nothing to get in and you get the vibe and can walk the track and stop at the temporary bars that spring up. However there appears to be races on the friday so is entry free ? Will they still have the bars spring up ? Hi Anton, maybe you went last year on Friday afternoon? There’s always on-track action in the morning on Friday, including the F2 (ex-GP2) feature race. Entry is free, including the grandstands (but the smaller ones do get full, so get there early.) 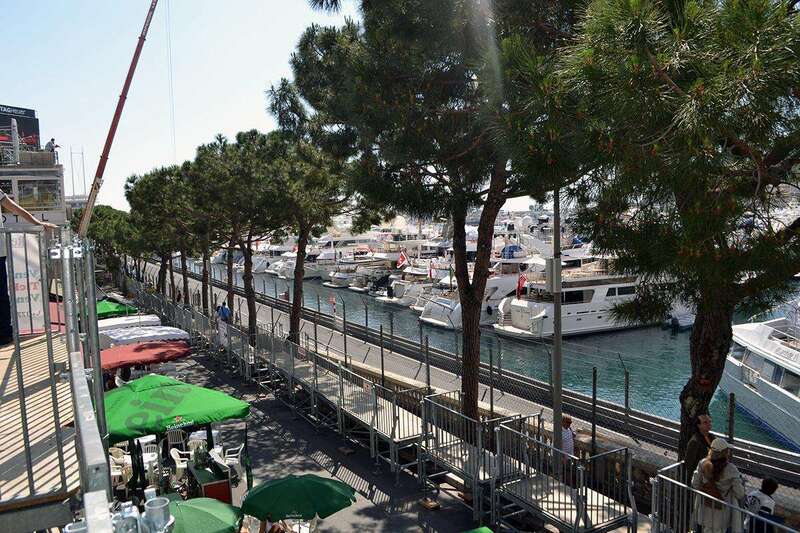 The track is opened from around 14:30, then you are free to do a track walk and go for a beer near the harbor. Enjoy! thanks for your info! It was an excellent source when I attended Montreal in 2014. Going to Monaco Thursday. When the track re-opens in the evening, can we drive our rental vehicles onto the circuit? Or is that evening completely packed with pedestrians doing the track walk? Hi, thanks for the compliment! You should be fine, but be aware there could be lots of traffic right after the circuit opens. Best to wait an hour at least after the track opens before you leave if possible. More people do the trackwalk on Friday afternoon, so I don’t think this will be a cause of delays. Hi Tony, you will find the way, it’s well signposted. The train station is actually right up on the hill above Ste Devote, which is not far from grandstand K. There’s lifts/escalators to get down the hill, then an underpass under the track to get to K. It should take you around 20 minutes, unless there are delays from too much foot traffic. We are attending the Grand Prix on Sunday and from what you said if we decided to drive from Cannes we should be able to find a parking spot at the football stadium even on race days ? You should be ok getting a park at the football stadium on race day, but worth getting there fairly early (before 10am if possible) to be sure. And don’t let your GPS try to take you through the center of Monaco! How is the accessability (how to get to) of the hotellobby of the Fairmont after the tracks closes down (07 am – 07pm). How do I get from the K Grandstands at Quai to the Fairmont. The only way, it seems the Fairmont has a second entrance at the back of the Casino de Monaco because the Av. des Spelugues and de Blv. Louis II seems to completely been closed down. Hi Sarah, the bus is a good bet and I don’t think will be too affected by the race. What time does your flight leave? I suggest no earlier than 20:00. It’s nice to not be in a hurry after the race. You can walk the track and take in the atmosphere. Hello! We are planning on going to Monaco GP in 2018, we have never been to a GP before. What king of tickets and in which spot would you recomend for first timer fans on a €500 budget per person? Thx. Hi Rosetta, if you are planning on going for the whole weekend, then 500 EUR per person is not such a high budget for Monaco; the tickets are expensive as you know. If I was going all three days on your budget, then I would choose different tickets for each day: Grandstand K on Thursday (80 EUR), Grandstand T Upper on Saturday (268 EUR) and Rocher General Admission on Sunday (110 EUR). The views from Rocher are not that great, but you will still be there. If you are just going on Sunday, then you have a good choice of grandstands within your budget. Enjoy your first race! Hello Andy, are there toilets near the places of Le Rocher? My wife and I have almost 70 and we go in 2018 from Argentina. Saturday in Grandstand N and Sunday in Le Rocher. Some tips to keep in mind please? Hi Luis, that sounds like an awesome trip from Argentina to Monaco. I really don’t remember toilets at Le Rocher, but there must be some for all the fans. It’s not that comfortable there, but you should be ok. Try and get there early for a good spot on race day! thanks Andy! If I do not decide to spend more money, I’ll tell you how I went with the Toilets in Le Rocher! Gain admission to cafe de paris. Hi Lola, if you book in advance with Cafe de Paris, I’m sure they’ll be able to tell you about access. You shouldn’t need an additional ticket (General Access tickets are not really even sold for Monaco), but you will need to find out about access, as the Cafe is inside the circuit. In June, 2018 we will be in Monaco for a day trip from Nice. Will we be able to “walk the Grand Prix track” and see the pits from the start/finish area off Rue Louis Notari? Is there any viewing access along the track? Hi Fran, you will be able to walk the Grand Prix track in Monaco. These are just regular city streets when the Grand Prix isn’t happening, so you can walk pretty much around the whole track, including Casino Square, the tunnel, swimming pool area etc. Enjoy! No ear protection needed any more really, the cars are not so loud. As to what to do for your wives, be aware that much of the city is closed off when the racing is on. But just over the hill in Fontvieille everything is easy to access. They can also go up to the Old City and do a Palace tour on top of the hill overlooking Monaco. Maybe your wives also want to spend at least one day in Nice when you are at the track, lots to do there. your information is very useful. Thank you! I have a ticket for Saturday on stand K and plan to arrive by train from Sanremo. Do you think, it’s too late to arrive at the station at 11:39 h to see the start of the practise at 12:00 h? Do they give seats away, if one doesn’t arrive early? Are there enough toilets at stand K or is there always waiting time for the ladies? Hi Stephanie, I think you should arrive earlier, around 10am. It will take around 20-30 minutes to get from the train station at the top of the hill down to your seat in Grandstand K. (Don’t worry, there are lifts!) They won’t give away your seat. If someone is sitting there, just ask them politely to move, or get the usher to help. Every grandstand has toilets behind it, but I can’t guarantee you won’t have to wait. My friend and I are touring Europe on a shoestring and have tickets for the GP (Rocher section). We are traveling in a camper van. Would it be wiser to park it in Nice and take the train or to drive it to Monaco on Sunday? I’ve read that for a good seat you must be there at 4/5 am? I’ve looked at the trains and the earliest departs at 5:30. Would this be early enough for us to still get a good view of the track? Cheers! Hi Max, I’ve never experienced Rocher on a race day, but I imagine it gets extremely packed early. Lots of people come every year, so they will know all the tricks to reserve the best spots. Everyone else just needs to fight for a good position. I think if you are leaving really early, you could drive your campervan and park somewhere in Monaco, or nearby. Check out the interactive map on the ACM site, you can search for parking near the circuit. Just don’t be in a hurry to leave at the end of the day. Enjoy the atmosphere and let the traffic die down! I plan on being in Monaco for the whole day and will have a hard time making it back to my hotel in Nice. Are backpacks allowed in the grandstands (section N)? Are cameras (DSLRs non pro no tripod) allowed? I have a vacuum thermos I wanted to use for water, is that allowed? Hi Wendall, you should be fine with all your gear. Just don’t bring in any glass bottles. Thank you for helping us about Monaco gp. I’m going to go to Monaco gp. I have only Sunday tickets. on Saturday I’m thinking of qualifying on the screen of the bar in Monaco. Could you tell me good bar to watch qualifying in Monaco? Hi Yuka, most of the bars I know in Monaco you will need a race ticket to enter. But I am sure there are many more. Perhaps nearby Place d’Armes, or across the hill in Fontvieille. Just walk around where you can, I’m sure you will find a good one. Attending Grand Prix Sunday, but have 8pm flight booked! Will I make it and is my best option the bus or train? Also will I be able to take my bag with me? I’ve heard some tracks don’t allow bags. Hi Chris, your flight departs too early. If there is any way to get a later flight, then do it. You won’t enjoy the race if you are worried about missing your flight. If you are flying from Nice, then I’d say you would even have to leave as soon as the race finishes to make it. Even then, you will hit peak time with other fans leaving the circuit and big queues/traffic. If you’ve only got a backpack, you should be fine. Otherwise, I suggest leaving it at the train station in Monaco; I’m pretty sure you can rent a locker there. Hi! We have tickets for Sunday and would line to see the qualifyers on Thursday. Do we have access to General admission/Rocher Thursday with our Sunday tickets? No you don’t. You need to buy separate tickets for Thursday. Cheapest Thursday ticket is Z1 for 54 EUR, or grandstands for around 80 EUR. You can go on Friday for free however. There’s no F1, but there is the Formula 2 feature race. I’m looking to attend on Sunday final race with friends, five in total but lame rocher tickets are sold out is there anyway possible of getting into the city and close enough to watch a screen without a ticket? You can try your luck. I’m pretty sure you can watch from the fanzone square called Place d’Armes. They should have a big screen and some outdoor bars there. Hi, I am attending with my husband on Sunday. Please can you advise what to wear for ladies ? We’re getting into Monaco on Friday afternoon. Is the pit lane open for ticket holders as we can’t see any information on the official race website? If so, what happens then? Can you see garages, drivers etc.? Hi Sarah, the Pit Lane Walk is not mentioned in the schedule this year, but there is a Drivers’ Autograph Session listed as running from 3pm to 4:30pm on Friday afternoon. This will surely take place in the pitlane. You should be able to see what’s happening in the pits, but the crowds can be very big and the path down the pitlane is very narrow. Not recommended if you don’t like crowds, and the top drivers will have the biggest crowds of course. Don’t forget to bring your weekend ticket to gain entry. Hi, any news on the train strikes over the race weekend? I am relying on travelling from Nice on Friday & Sunday. Hi Trevor, I think there is a different schedule today due to strikes, but no news about the rest of the weekend. Check the Automobile Club de Monaco (ACM) site for updates. Hi there, question, are small strollers allowed in grandstands? We are sitting in O section. And wondering if our stroller would be allowed in. Thank you. Hello there. Are strollers allowed in grandstand O? I love your prompt replying!! Thanks so much in advance – we are looking to take our dog to the race. Either grandstand P or the rocher. B) is it just too loud for dogs, does anyone do it?! G’Day Stephen, tickets normally sell out in advance. It’s a much better idea to buy your tickets online in advance and choose the option to collect them at the track. Our ticket agency Gootickets has this option. I recommend the Z1 General Admission zone over Rocher, but Z1 is already sold out for race day. Saturday tickets in Z1 are on sale for 99 EUR at present. I have general admission tickets in Z1 at Tabac. Hard to see from pics where best to aim to sit, any advice? Well, you don’t sit in Z1 – it’s standing only. There are plenty of small platforms in the area – I guess the best ones are the closest to the Tabac corner. I haven’t been there on race day, but I’d say that people probably get there early to reserve the best vantage points. Hi! What are the fees for the autograph sessions? Is there a good chance you won’t be able to get a particular autograph due to crowds? No fee for the session – you can go if you have a weekend ticket. But this is Monaco, and the autograph session is not the best place to get autographs. It can get crowded and you may not get close for the big drivers The entrance to the F1 Paddock is a better place to hang out. Or you can just walk around the harbor and city – keep your eyes open, as drivers can be walking around at any time. Don’t forget, this is home for many of them! I am lucky enough to be going this year. Sitting in Z1 at Tabac. What would the dress code be? I have heard that shorts are frowned upon? Hi Adam, I think dress codes only really apply to hospitality suites and terraces. If you are in Z1 or the grandstands, you can wear what you like. Make it comfortable and check the weather forecast!